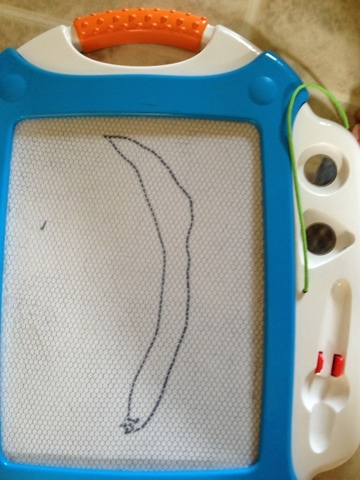 We have ourselves a little artist! 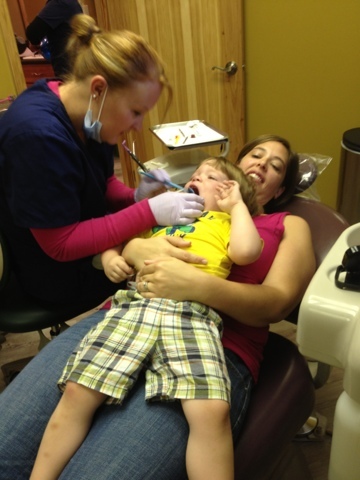 Redmond goes to the dentist! 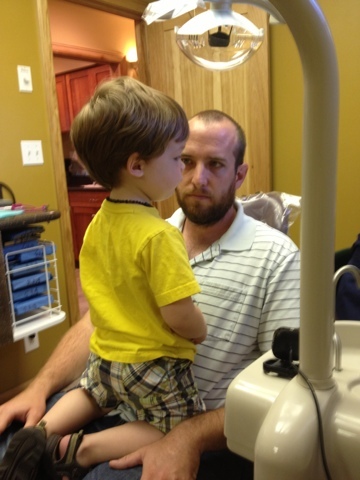 Redmond had his first dentist visit today. Not going to lie, I was expecting the worst. I figured he would scream and thrash through a clenched jaw, refusing to open his mouth. Thankfully, I was wrong. He did awesome! He started out on Jason's lap. 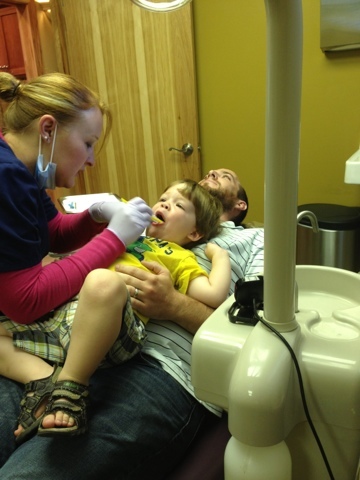 He was hesitant to open at first, but when the hygienist offered to brush his teeth, he opened right up! Two of his bottom teeth came in with buildup on them - he even let her scrape most of that off! 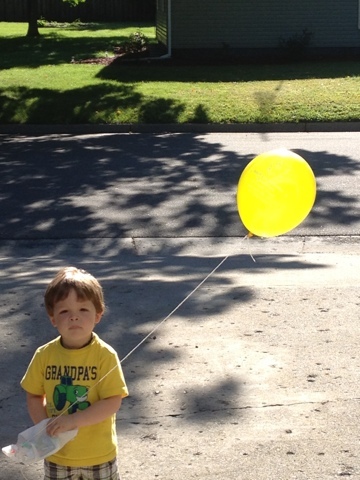 When he was almost done he burst into tears and asked for me. So, Jason and I swapped places and I laid with him. He was over it before She was able to get all the buildup off, but she got most of it. We'll get the rest in six months at his next appointment. After he was all done, he got a new toothbrush (he picked an orange one), toothpaste, Thomas sticker, big bouncy ball and a balloon! No wonder he asked to go back once we got home! We have our hands full!! 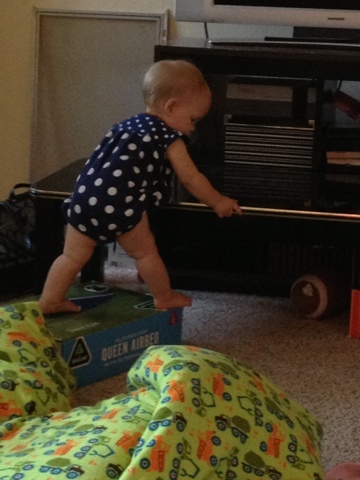 Just two days shy of 10 months and she's already climbing! Unfortunately I didn't get a photo when she hiked her leg up trying to get on the table. Well, got that "first" over with. Had our first ER trip last night. After getting Ashlyn in her pajamas last night she was VERY unhappy and inconsolable. She would nurse, but would stop occasionally to scream and cry. When I switched her from my right to my left side I realized that she was not moving her left arm at all. When I bent it, she screamed and howled. 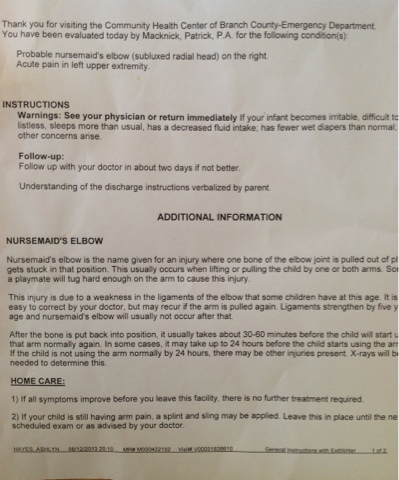 So heartbreaking :( My first thought was that she had Nursemaid's Elbow. Although I never felt a "pop" when I was getting her dressed, she did fight me more than normal and I struggled getting her arm out of the sleeve of her dress. She is doing much better today. Still not using her left arm too much, but slowly using it more and more. Poor baby!